The big news this month was Humboldt: they finally got into gear and put in a huge month! Iola kept on riding steadily, while Garnett logged a few, Ottawa stalled out entirely, and the remainder of the communities are still stuck at zero. There’s only one more month left in the Challenge, so ride, ride, ride! 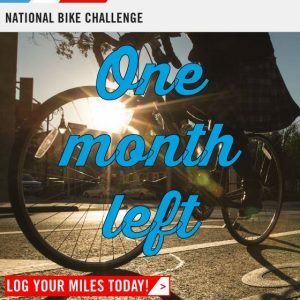 Log those miles in the National Bike Challenge at NationalBikeChallenge.org!